McGowan Fine Art – Concord, NH announces the opening of “Beyond the Caliper” featuring the art of Adelaide Murphy Tyrol. The show will run from September 8 through October 9, with an artist’s reception onSeptember 11 from 5 to 7 PM. This is free and open to the public. Ms. Tyrol has been the arts editor & an illustrator for Northern Woodlands magazine for twenty years, as well as the long-term weekly illustrator of that magazine’s The Outside Story syndicated newspaper series. Her association with Northern Woodlands has given her the opportunity to enliven through images subjects as diverse as feral swine, apple scab and river snot. She expands on the captured details and gesture of her illustrations to create her more artistic paintings which have a more emotional component. They move beyond the caliper and its realm of science, fact and illustration. Tyrol has traveled from the shores of the Galapagos Isles and Northern Scotland to the estuary of Cedar Key, Florida observing species in their natural habitat. 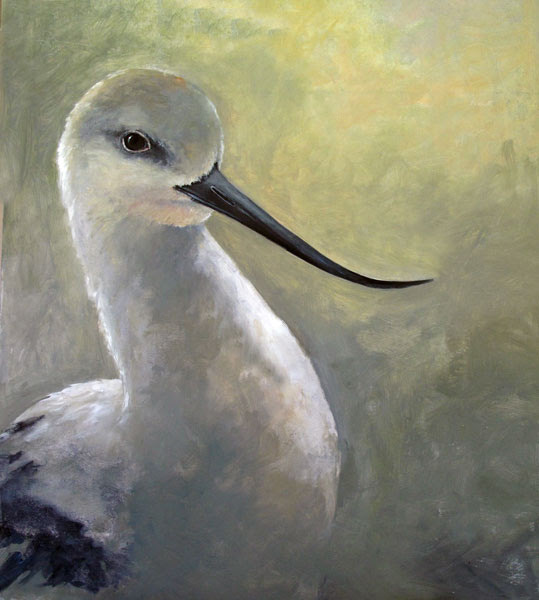 She tells the story of their beauty and destruction of habitat in paint. Staying in a house on stilts in the verdant estuary of Cedar Key, where freshwater and saltwater collide, Tyrol was surrounded by lush plants and a multitude of insect and animal life. “I was very moved by the softness of the light in Cedar Key. Day by day, hour by hour, the birds responded to the changing tides – shifting themselves, repositioning as new tidal feeding opportunities presented themselves.” One of her favorite birds is depicted in “Avocet, Non-Breeding.” Its delicate, upturned beak is a hint to how it spends its days- sifting for insects in the surf. The full gaze of the bird engages the viewer as if to invite them into a conversation. In “Birds of Cedar Key” an array of colorful eggs float across the landscape illustrating the variety of birds that depend on the fragile environment. It is a symphony of speckled blues, greens and ochres. Many of the artist’s subject selections are unexpected, for example, showing the intersection of beauty and decay. 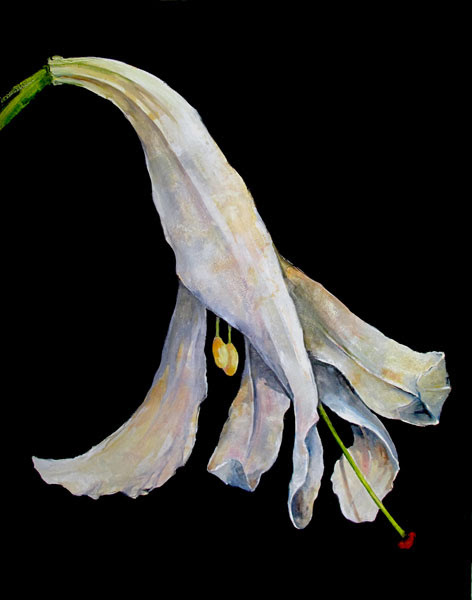 In “Lily,” a dying blossom slowly curls into itself. The wilted petals create a lovely origami of sensuous curves with pendant, pistil and stamen. Tyrol’s unique view beckons us to enjoy the full beauty of the flower, passed but not faded. A “Bird of Paradise” gets a similar treatment. The cockscomb of color on this exotic flower has begun to wither creating tendrils of orange and red. The rigid stalk is beautifully rendered in brushstrokes of green and pink, playing against a dark background. This show is made possible by a collaboration with Northern Woodlands Magazine, NH Charitable Foundation, and theMontshire Museum of Science. The exhibition of Tyrol’s illustrations titled “The Outside Story; Artwork by Adelaide Tyrol” will be at the Montshire Museum in Norwich, Vermont fromOctober 17 to November 29, 2015. 603-225-2515 for more information or visit our website at www.mcgowanfineart.com.